Fully programmable, CODE combines authentic modeling of classic and contemporary Marshall tones with professional quality FX. CODE preamp, power amp and speaker cabinet models have been developed in collaboration with audio software pioneers Softube to create Marshall-Softube (MST) modeling, highly accurate recreations of classic and contemporary Marshall products and more. This review has been selected by our experts as particularly helpful. 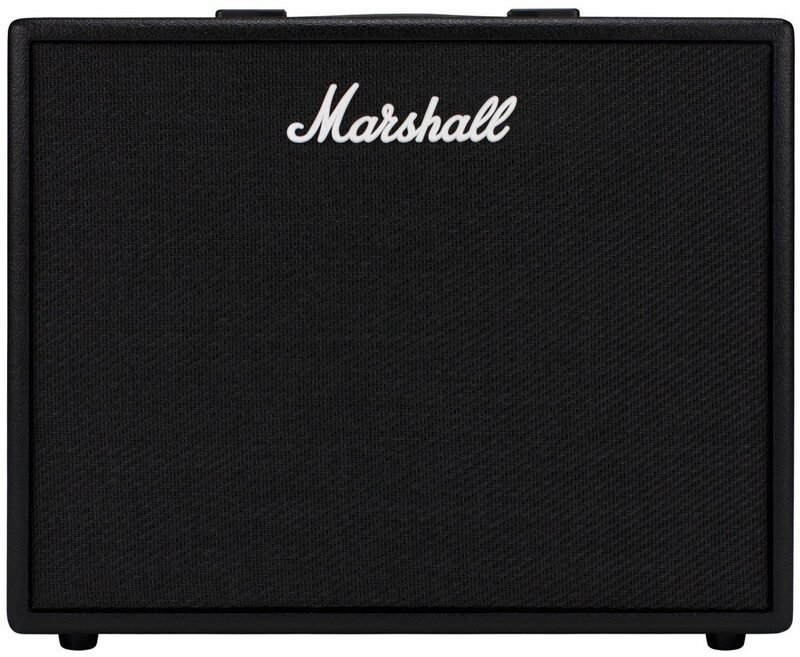 "Marshall Code 50 Combo Amp sets the precedent"
Sound: My first guitar amp was a Marshall, purchased 28 years ago. The potential sounds that can be produced from this amp are surprising. 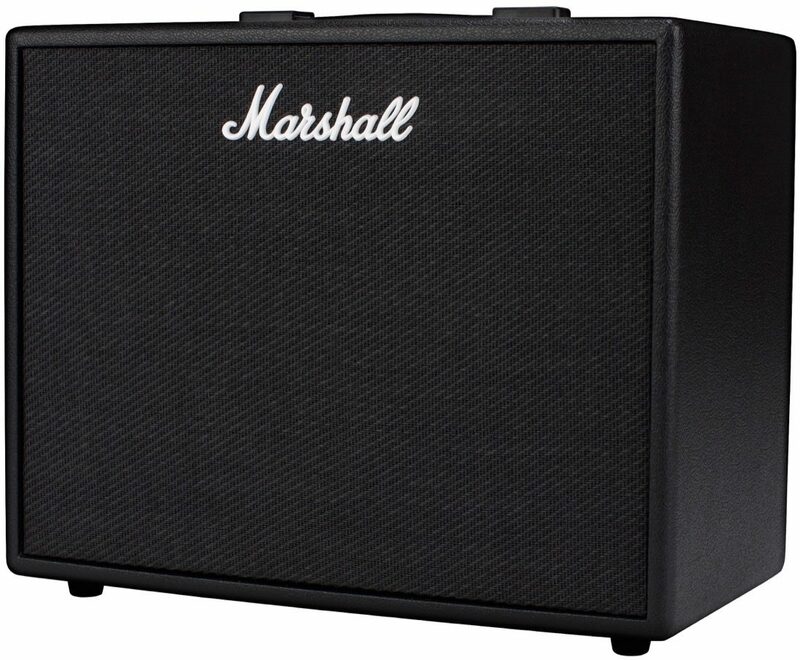 This amp can essentially reproduce any sound within the Marshall Universe, when dialed-in to match what one expects, from say a JCM800, JVM, 2555, or the Silver Jubilee. Feature: Though a mini-USB to PC cable, one can also record to a DAW; the amp has a built-in computer interface through USB.There are knobs on the top of the amp that can be used to change from preset to preset. Tones can be dialed in directly by using the control panel at the top of the amp. The sound is penetrating for a smaller amp even at low volume. On headphones the sound is excellent and complete in terms of the full range of sound that the amp produces. Some are not fond of the control panel on the top, but I actually prefer plugging in to the top, and not a face panel. And the app removes need to dial in sounds directly from the control panel. The Bluetooth feature really stands out for me (described in Ease of Use) Ease of Use: One of the really awesome things about this amp is that the Bluetooth functionality allows one to control the amp through an iphone, Android phone, or tablet, using the Marshall Gateway app. This app is like the icing on the cake. 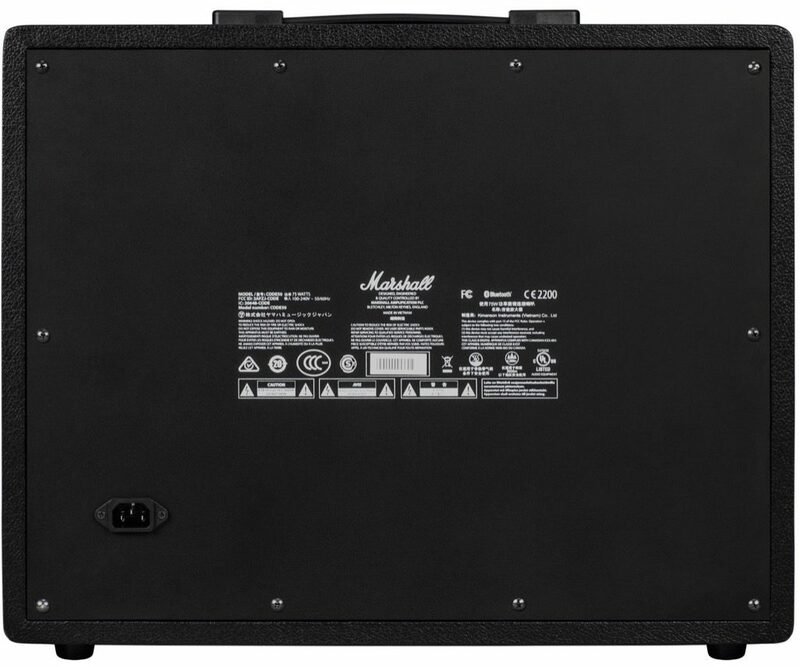 Instead of fumbling with the knobs and pushing buttons at the top of the amp, Marshall Gateway gives you nearly direct control over selecting presets (LIBRARY tab). Just swipe the touchscreen to access the other tabs like (AMPS) to change cabinets or the (EFFECTS tab) to tune-in the right sound. Quality: Further the Code 50 does not look like a tiny practice amp, has a relatively small footprint, but is build solidly. It's not made from "Corinthian leather" nor would I want it to be. 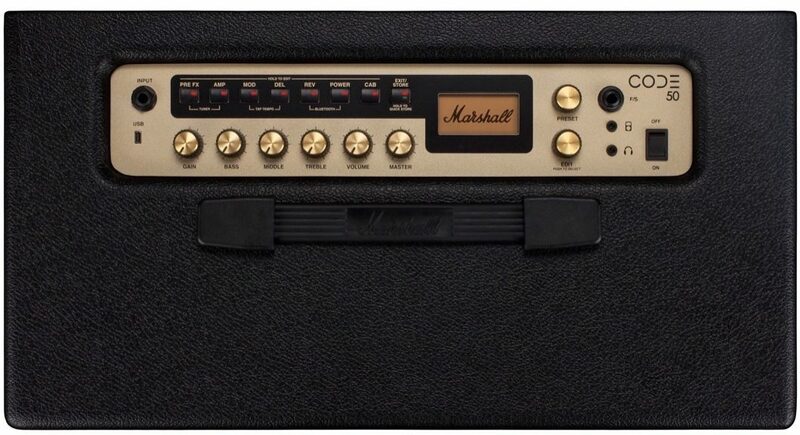 Of course it has that classic Marshall look and with the golden control panel and knobs. 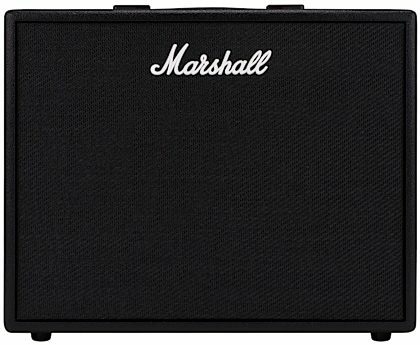 Value: With all the features and most importantly, the sound produced by this amp with traditional Marshall quality and attention do detail, at such a jawdropping pricepoint puts Marshall back in the front, with a modeling system that reproduces the amp sounds I care about most! I am astounded by the quality and value of this amp at a cost that I still have difficulty believing. The level of quality, while suiting my needs without finding space for a full Marshall stack, and when I could never turn the volume up past "1" or "2" without getting the neighbors seriously ticked off. lol. 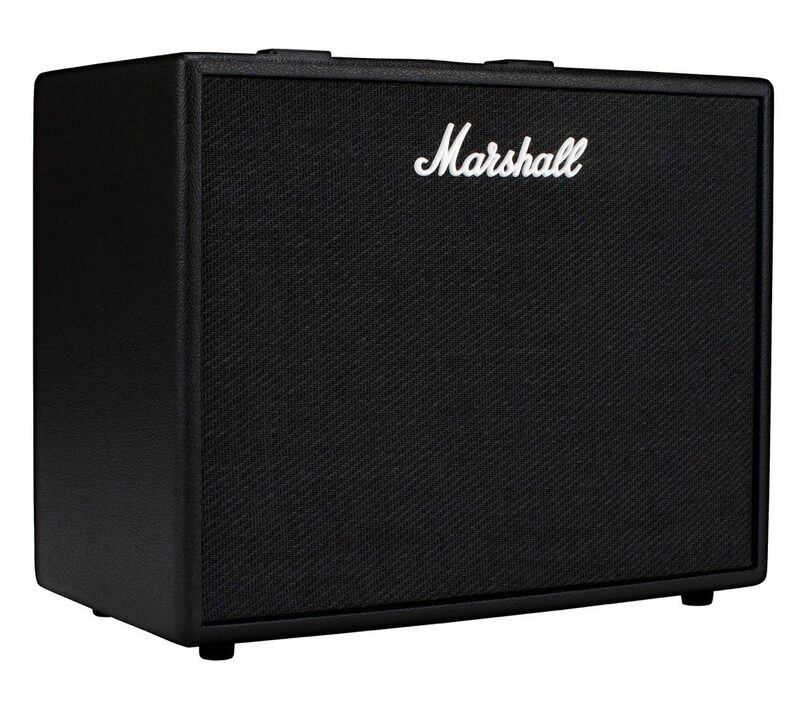 Manufacturer Support: I contacted Marshall to ask them a question about the amp and the representative who replied the next day and assisted me, Hannah, was very helpful and seemed sincerely interested in my personal experience. The Wow Factor: The Code 50 achieves what I did not consider possible before for modeling amps. I have used modeling software to try to attain classic Marshall sound above all other amps, but it was difficult. Finally I went to source and I've gotten what I wanted. For me, from the time I discovered that this amp existed, to opening the box, to plugging in, till weeks later when I can fairly review the amp, it's been just huge wow factor. The biggest "Wow" for me still is: what one gets in return for an almost revolutionary price. Overall: Marshall's latest endeavor in modeling amplifiers is a big win for guitarists, not surprising from a company renown for its high standards. Sound: I think this sounds way better than my Blackstar id core 40. Soo many voice choices and sounds fantastic. Feature: App is amazing to use with amp. By far one of the reasons this amp caught my attention. Ease of Use: Very easy to use. Sit down and play with many voices at your fingertips. Quality: Seems very solid and well built. Value: Soo worth the money. I was looking to spend way more and I'm glad i didn't and purchased this amp. Manufacturer Support: Didn't need to contact by phone but i had emailed them with questions prior to purchase and was contacted back quickly. The Wow Factor: For me it was a total WOW when i unboxed it. Overall: I've had a week now to use my code 50 and i love it. I was a Blackstar amp user this is my first marshall amp. Sounds great even at low volume. Easy to use settings. I purchased foot pedal at same time and it works well however i do find myself using the app on my phone to change settings more but pedal would be great for the stage or fast changes. Only thing I'm not a fan of is the knobs on top i wish they were on the front like on the code 100 head. One caution is... this amp can go very loud if you live in an apartment building like i do your going to need very hard of hearing neighbors to keep them happy. Headphone jack works well and tuner on amp and with app very easy to use. The best part was of course zZounds 4 pay and service. This was not my first 4 pay or purchase and once again fantastic service all the way from chat line to delivery. Will not be my last purchase i am positive of that! 31 of 31 people (100%) found this review helpful. Did you?